Glass is a surface which graffiti vandals like to use due to the fact that it is visible from both inside and outside of the building. Our glass graffiti removal services can quickly and effectively remove damage from the glass surface, saving a considerable amount of money versus glass replacement. We can perform graffiti removal services on storefront windows, plexiglass surfaces, and other types of glass. Our graffiti removal from glass produces perfect results which deter vandals from future damage. We can repair the glass after hours if disruption of tenants is a concern. 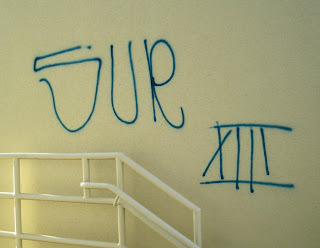 In the case of glass vandalism, it is important to repair the glass quickly in order to deter future damage by vandals. Commercial glass repair is just a phone call away.can repair a wide variety of damage to glass surfaces.